They seem a marching army of ghosting spectres. I love the first one – the flecks of snow give it more dimension, at least for me. Thank you, I was trying to capture the sense of snow with these; it was quite tricky – I’m not sure these snow ones are as successful but I thought I would post them as they were part of the process. hello , without the comments to read the story behind , number two is my favorite. it invites to visit the avalons and it possesses some brown color very well done. But indeed karen , the story behind of yourself is to catch the snow, So indeed and to me, the first one , is representing that. I agree – there’s a really nice tension between the surface and the perceived depth – again, very painterly. Thanks, Richard. That’s good to hear. I was actually hoping a deer would come trotting down the path while I was taking these but there was no such luck! Your first image here is a book cover waiting to happen. Well, thanks – I’ll have a look! Beautiful. Having been all set for spring, we might just get a flurry or two of our own in the next few days.. hope the cold snap doesn’t last. It must get very trying having such a long winter Karen.. Thanks, Adrian. The winters are indeed, long – it’s the snow that makes them beautiful though, I think. It would be awfully dismal here in the freezing cold without snow. Plus, I love to ski! I have to thank you for being inspirational! it might be a shadow of my long forgotten memory. Again my mind drifting away to yonder of space and the time. Yoshizen, thank you – a lovely reaction. Nathan, sincere thanks for that! I’ve been immensely enjoying making these photographs. 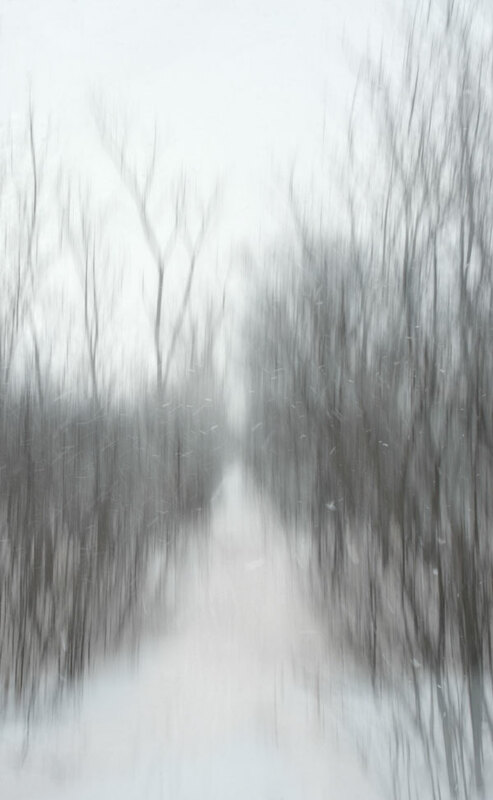 Even more than the tree thicket and scraps of snow, I love the path that leads the viewer into the maze. Your art is mysterious, a quality I love. You would have also loved Tucson two days ago – an amazing snowfall of 5 inches here (I know, I know) and we are still looking at deep snow on the mountains. Oh, wonderful! They are so “etchy”- there is a feeling of dry point in these lines! Thanks, Marija. I like that “etchiness”, too – as you know! More gesture drawings with photons? Interesting images as usual. Carla, thank you so much. It makes me very happy to think you would hang that image on your wall. Yes, it’s neat to see how similar ideas translate so differently in diverse landscapes. Your movement series is wonderful. Really excellent Karen! That first shot especially jumped out at me! That’s nice to hear, Phil.Thank you! I’m thinking of printing that one out – I think it would benefit from looking at it, with some distance. Wonderful both of them, especially the first. Magic, Karen. The flurries create such delicate, dreamy dimension. So beautiful. You’ve surpassed yourself again, Karen. Like Phil, I really love the portrait shot as well. Really, really gorgeous. Distan, It’s very nice to get such lovely feedback from you. Thanks very much, I’m pleased you like these. lovely and the path invites me down it.. Thank you, Sara. I take a lot of pleasure in doing this sort of work. I’m thrilled you relate to them in some way. A flurry and a dream. Magical winter paintings!!! Anna, that’s exactly what I’m trying for, I think. More than a landscape – a sense of it, I guess. What a kind comment, SIG. Sincere thanks, you put a smile on my face. 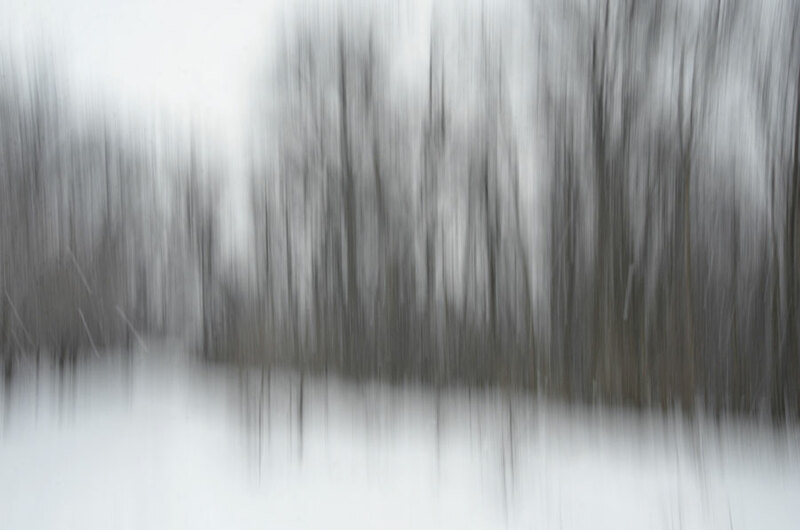 The contrast of scale, texture, and distance between the snowflakes and the trees in the top photo are arresting. The second image doesn’t have the same charm. Hi Gabriel, yes the first one really “caught” the falling snow. It’s tricky to do that while moving your camera. I’m glad you like it, thank you. These are just so powerful – somehow they remind me of your wrapped trees from a while ago. I think they good go well with that suite. – I shudder to think of going out into that cold. Kinda makes me think of Inspector Gamache traipsing around in Three Pines. Hi Emily, thank you. I think it captures the sense of beauty of a snowy day, I’m glad you like them.